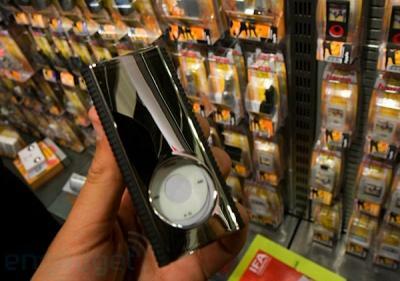 Engadget Spanish has found an actual case for the unreleased 4th Generation iPod Nano at the IFA 2008 expo. The case resembles the circulating rumors of the taller/rounded iPod Nano that is expected for release in September. The case is by Hama and is a Sport Case specifically labeled "for iPod nano 4G". Word of a taller case were first reported by iLounge. Kevin Rose later added a more details including a mockup photo. Other 4G iPod Nano cases have been seen online but this is the first time it has been physically spotted in the wild.